albertnet: Bring Back Home Economics! Yesterday my younger daughter begged my wife to teach her how to use a sewing machine, so she could make a stuffed animal. This kind of “quality time” is a mixed bag for parents. We love our kids’ enthusiasm and creativity, but sewing is really tedious. I thought, “Why hasn’t my kid learned this in home ec?” The answer, of course, is that home economics class is seldom offered anymore. Wikipedia estimates that 5 million American students study home ec, only a tenth of the 50.4 million total elementary and secondary students tallied by the National Center for Education Statistics. This begs another question: why the hell did we get rid of this? Herein I provide a little history, and present my case for bringing home ec back—but in an improved version. Back in the dark ages, young women and girls were automatically segregated off to home-economics classes, where they were indoctrinated with the belief that cooking was one of the essential skill sets for responsible citizenry—or more to the point, useful housewifery. When they began asking the obvious question—“Why me and not him?”—it signaled the beginning of the end…. “Home ec” became the most glaring illustration of everything wrong with the gender politics of the time. Quickly identified as an instrument of subjugation, it became an instant anachronism. The solution to the sexism of the traditional home ec approach was all backwards. Instead of killing home ec, why didn’t the education establishment simply make this class mandatory for both boys and girls? When I was in junior high, home ec was at least offered, and due to the way our curriculum dealt with electives, lots of students ended up in this class without having actively sought it out. Thus, a lot of us were exposed to cooking and sewing who might not otherwise have been. Were we happy about it? Not terribly, I’ll confess. I learned more about cooking from watching my mom, and meanwhile my home ec teacher was a total flake who kept forgetting (or perhaps “forgetting”) to buy the groceries we needed, so we wasted a lot of time with BS like home ec themed spelling tests. (I remember spelling lasagne “lasagna” and campaigning, successfully, to have my alternate spelling accepted. I’d have respected the teacher more had she stood her ground.) One thing I did appreciate was being taught how, when preparing a meal, to sync everything up, so the entrée isn’t getting cold while you’re making the salad, etc. I mocked this at the time as being so obvious, but actually it hadn’t occurred to me. And the sewing lessons, I have to admit, were pretty cool. 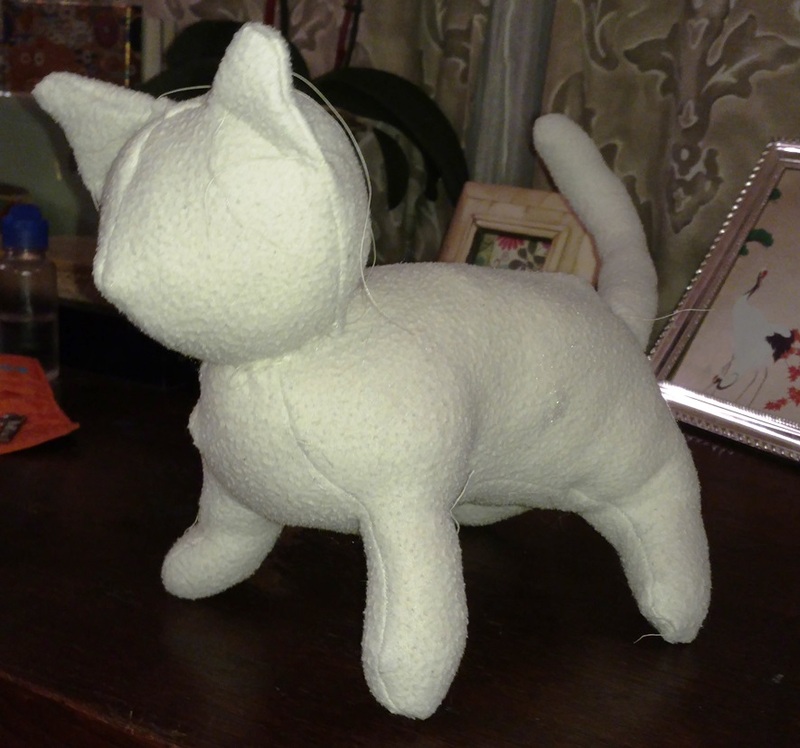 I felt a sense of accomplishment learning how to work a sewing machine, and made a pretty fair stuffed animal (though nowhere near as cool as my daughter’s creation above). My brother fell in love with sewing, and bought his own sewing machine so he could make cool parkas—first from a kit, then a pattern (both available, amazingly enough, from mountaineering stores) and then from scratch by copying commercial designs. I remember going to the North Face store with him to be his mannequin, standing there wearing a $300 parka while he sketched it out and noted all the measurements, wielding a tape measure as skillfully as a tailor. Are home ec skills still germane? No, I’m not delusional: I’ll be the first to admit that sewing is pretty much dead. My brother was an anomaly and almost nobody sews anymore. It’s hard to justify the time you’d spend, when Chinese sweat shops turn out such great stuff for so cheap, and thrift stores sell perfectly good clothing for less than you’d pay for fabric. Even my talented and skilled brother rocks an authentic North Face parka these days … I’m pretty sure his sewing machine is just gathering dust. But home cooking? As Bourdain laments, that really is a dying art, though we all still need to eat. I’m amazed at the growth of restaurants since I was a kid. Back then, going out to eat was a big deal—not just for my cash-strapped family but every family I knew (and this was in Boulder, Colorado, a fairly affluent community). Nowadays eating out is a regular feature of life, to the point that kids are downright jaded about it. The problem is, restaurant food is no good for you. As Bourdain pointed out in Kitchen Confidential, the calorie information provided on menus is pure hokum, based on some hypothetical version of the entrée and not accounting for lack of quality control. Line cooks use way more butter than you’d have the nerve to use at home. And the giant portion sizes are absurd. I’m a notorious glutton possessed of a cyclist’s appetite, and yet I can generally get my fill at a restaurant via a single entrée. In a sane world, I’d need two entrees. Restaurants are teaching us how to overeat. My kids are lucky: they have a stay-at-home mom who’s a great cook and happy to teach them. But so often, this isn’t possible because both parents work and don’t have the time or patience to let the kids help (or often, to serve a homemade meal at all). All the more reason to teach cooking at school—nothing fancy, no fois gras, no lobster foam, no standing rib roast; just the basics so that the next generation of adults isn’t completely hopeless at it, and kids are exposed to cooking as a legit, fun, salubrious thing to do. Exposing kids to cooking early might inspire some to develop a passion for it (like my brother going on to make those parkas). So yeah, let’s bring cooking back. And fine, we can jettison the sewing. So wouldn’t this just make it a cooking class? No, because I want to add something, which was theoretically a part of home ec all along but never showed its face in my class: the economics part. (Bourdain doesn’t mention anything about this, either.) I’m not just talking about how to be frugal, but a more fundamental understanding of how money works—how it shapes the reality of your household as much as your income level. For starters, some nuts-and-bolts book about building wealth, such as Rich Dad, Poor Dad, should be required reading. Budding adults need to learn about the miracle of compound interest, the meaning of opportunity cost, the real cost of consumer goods (i.e., the thing’s price tag plus the tax you paid on the income required to purchase the thing), and mortgage amortization. This isn’t hard math—it’s far easier than what you’re required to learn just to graduate—but it’s important math that can affect your daily life. None of this is currently taught in my kids’ schools. You get the normal fundamentals without any context about how to use them (other than a few word problems), and you get some weird, abstract, theoretical math that you might use in your career but most often just forget. What’s needed is instruction about how not to be a chump, with plenty of real-life examples. To increase my self-satisfaction, and as an exercise, I calculated the true, all-in cost of that vehicle: the delta between what it cost and what a used equivalent (with the same warranty) would have cost; the interest on the monthly car payment; and the impact on my colleague’s overall net worth of having bought a used car with cash and putting the savings toward paying down his credit card. The punchline? The real cost of that SUV, I calculated, was about $140,000. This kind of waste explained why my colleague, whose income was similar to mine, carried that balance on his credit card (which of course led to even more money down the drain). Wasting money like that doesn’t just lower your standard of living, but limits your maneuverability so you can’t take advantage of sudden investment opportunities. Here’s an example of the kind of opportunity I’m talking about. Many years ago, my mom decided to sell her condo and buy a smaller one. She was being sweet-talked by a mortgage broker into taking out a bigger loan than she needed, so she could renovate, etc. I recommended she borrow only what she needed, and offered to loan her money as needed for renovations. She decided on a nice, small mortgage. I also counseled my mom on stipulating no pre-payment penalties, so she could pay down her loan’s principal faster. I used an online mortgage amortization calculator to model multiple scenarios for her, so she could appreciate the impact this makes. Six months or so later I happened to ask if she was paying extra principal when she could. She replied, “No, because the bank makes it difficult. I have to mail the extra principal to a different address.” Those thieving bank bastards! Clearly they’d created this obstacle deliberately, and it was working perfectly. I decided to punish the bank, save my mom some money, and get some income for myself all at the same time. Being a frugal guy with a used car (and, if I recall correctly, in the process of saving for my own home), I happened to have a decent amount of cash lying around, and was able to pay off my mom’s mortgage in one lump sum, and then let my mom pay me back instead of the bank. I split the difference between her former interest rate and what I could get with a money market investment, so she saved on interest and I made some nice cash with virtually no risk. None of this is rocket science—and yet based on articles like this one, it appears household finance is blind spot for many families. My mom surely had home ec classes as a kid, but despite being a great cook and even sewing a lot of clothes and stuffed animals back in the day, she never got formal instruction in practical financial matters. I don’t know how to influence our school systems toward this end, and will leave that up to the administrative geniuses who (in my dreams) will take this essay and run with it. But I do have a suggestion for a name for this reinvigorated class: how about “home econ”? What if Allegiant Air Pushed Things Further?